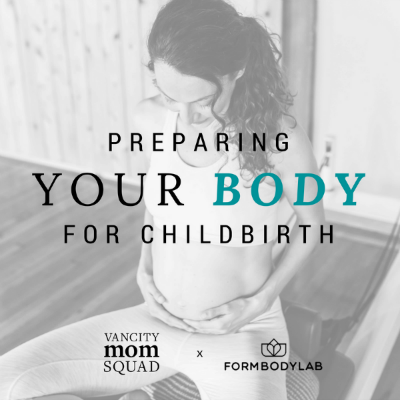 Form Body Lab has partnered with local social network for moms, Vancity Mom Squad, to raise awareness around pre- and postnatal conditions with a free, educational event to help women physically prepare their bodies for childbirth. It is estimated that approximately half of women experience urinary incontinence or Diastasis Recti (abdominal separation) after childbirth. However, these pre- and postpartum conditions can often be prevented or rehabilitated through consistent Pilates practice, massage therapy and physiotherapy. Form Body Lab has partnered with Vancity Mom Squad to offer a free community event to help prepare soon-to-be mothers for childbirth and show new moms how such conditions can be improved through rehabilitation. “Every woman’s pregnancy and birth experience is different and we are here to prepare moms and provide them with the tools they need for the great physical challenge of birthing a child. It’s definitely a passion project to help expectant and new mothers prevent physical conditions associated with childbirth,” says Jessica Slonski, Form Body Lab owner and founder. Form Body Lab experts, including a Pilates instructor, physiotherapist and registered massage therapist, will lead a panel discussion and Q&A session focused around preventative and rehabilitative methods for various physical conditions associated with pregnancy and childbirth. Plus, we’ll be offering one-on-one consultations, a mini pop-up shop featuring local mompreneurs, and refreshments courtesy of The Juice Truck, Vital Supply Co. and more.